Sonata For Organ. Composed by Julius Reubke (1834-1858). Edited by Hermann Keller. Organ (Solo). Classical Period. Organ solo book. With introductory text. 27 pages. Duration 00:28:00. Edition Peters #EP4941. Published by Edition Peters (PE.EP4941). ISBN M-3007-0012-0. 9x12 inches. Key: C minor. Reubke composed this sonata while studying piano and composition in Weimar with Franz Liszt, completing it in April, 1857 (tragically, Tuberculosis would claim him a year later, at the age of 24). He dedicated it to Professor Carl Riedel, and played the premiere on the Ladegast organ of Merseburg Cathedral on June 17th, 1857. It is an extremely individual work, requiring very advanced pedal technique; and considered to be a pinnacle of the Romantic repertoire. It is a Symphonic Poem, in that its three movements are connected, yet formally independent. 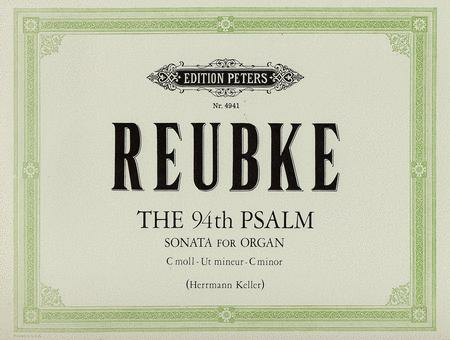 It is programme music, in that the text of the 94th Psalm is used to inform the mood of the work. precise as does phrasing. There is a recording of Fox at Hammond Castle, a place he literally used to hang out to play that machine. 14 of 31 people found this review helpful. March 24, 2006 Imagine THIS on the Wannamaker! particular piece I think, if I were to choose one, would have to be my all time favorite piece of music, I'll never grow tired of hearing it. The dynamics never fail to make my blood flow. Make no mistake, THIS is the kind of music the organ was built for! Speaking of dynamics, no doubt the influence of Franz Liszt is evident as he was Liszt's prized pupil, need I say more? Some say that this is one of the most significant organ pieces written in the entire 19th century. Well, it certainly has my vote. Ruebke' was a budding genious before being stricken at such a young age. One can only wonder what else would have come from him had he lived a normal lifetime. Lucky for us, he still left us this! : Do not buy the peters edition, it has a lot of mistakes, look for the faksimiletext (NMW) or the Oxford edition. the psalm with this work.